30 in. x 84 in. 30 in. x 96 in. 60 in. x 30 in. 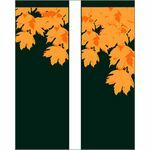 Fall Leaves on a Green Background Double Design light pole banner comes with the art printed on both sides of the fabric and finished with a 3 inch pole sleeve top & bottom.